Rockstar Energy Racing's Jason Anderson didn't have much time to revel in his championship winning Supercross season with such a short break before the Motocross Season's inaugural round of 2014. In fact, two days after Vegas SX, he had his wisdom teeth pulled on Monday and was back on the bike Tuesday. With such intense focus on the task at hand, the 250 West Coast Title will likely not sink in until the end of the outdoor season. However; he did come in Glen Helen carrying a lot of momentum. Anderson is certainly very aggressive on the bike and to many spectators, the most fun to watch circle the track. That's rings even more true on outdoor style tracks with his amazing ability to scrub and stay so low at times that it appears that he doesn't leave the ground. Yet somehow he does this with complete control. Jason was the 2nd fastest 250 rider in the final qualifying practice. With his level of fitness, this is a very good spot to be. Everyone knows that JA will be very strong in the final 5 minutes. 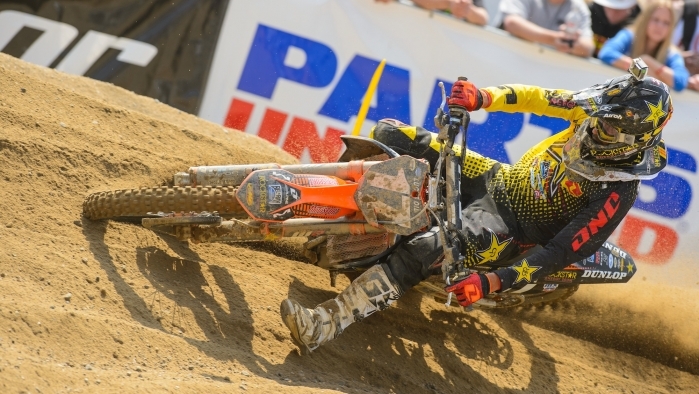 In his first moto, he got good a good jump off the gate with his front wheel in the air and shifting through gears. Unfortunately when he set it down, the wheel sunk into the very soft, deep soil, slowing his drive considerably. When on the line with 39 other professional racers, any loss of speed will put you far back from the lead. The 17 was mired in the pack well out of the top 10. All of his main competitors that the MX pundits predicted to be the top 5 fastest outdoor riders, sprinting away in front of him. Anderson proved his prowess during the initial 35 minute moto, catching and passing all but two riders, en route to a 3rd place finish. In the final 250 moto of the day, Jason again didn't get the best of starts but improved vastly over the previous one. He was rapidly moving towards the lead pack once again until just past halfway he began to slow his pace. With the deep soil and steepest hills of any track on the circuit in play, Glen Helen can be very trying on any bike out there. Especially with the rate of speed top riders are traveling. Jason had a feeling something might be wrong, so he kicked it back a notch. This particular track has huge obstacles and he was wise in that decision. At times not even jumping the massive triple all the way, yet still remaining in an overall 3rd place position on the day. Unfortunately at the very end of the race, something happened and he was forced to DNF. One of the most amazing things of the day was Jason's attitude going into next week. Even after putting his best effort forward and being thwarted, he was just happy he was able to be out there racing his dirt bike. It's a long season with 22 more motos remaining and he knows he is certainly not out of this title chase. Jason Anderson: "I had a good first moto, then in the 2nd moto I was feeling alright but ended up having some issues about halfway. I wasn't able to finish the moto. There was something going on and I just wasn't able to push from then on. I felt fine but there are a lot of big jumps out there and I kind of just wanted to make it through the race, which ended up not happening. It's not a good situation to be in but we'll figure it out and be ready next week." The series moves just a few hours north next week to Hangtown MX at Prairie City ORV. Anderson will surely rebound and begin to close the points gap.Davi Millsaps, who was unable to line up at Glen Helen due to further issues with his injured foot, will continue to rehab. Joey Savatgy suffered a broken collar bone prior to round 1, but should only miss a couple of weeks.